It’s graduation season and I’ve been feeling much like a Crone lately. 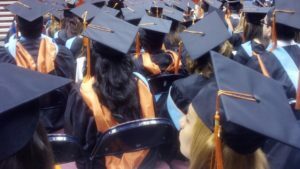 So here are some things that I didn’t necessarily know when I graduated and they are my advice to grads – or to anyone who cares to read it for that matter. 1. Don’t think that the first job you get will be what you do forever. I held several ‘careers’ before finally starting my own business. I got my Ph.D. because I wanted to do cancer research. But that led me to wanting to educate people on how to prevent cancer. I worked in medical writing and teaching (anatomy/physiology, biology and microbiology) before starting my own business in cosmetic science and agriculture. But everything I did along the way helped educate and prepare me for what I am doing now. 2. Your education is not over. Learning should be a lifelong pursuit. Continue to advance your education and know as much as you can; not just education as it pertains specifically to your job, but also peripheral things. Read books, take on new hobbies, do things you’ve never done before. Just have outside interests that force you to learn new things. 3. Take time to relax and recharge your brain. Being dedicated to your job and spending time with it is a good thing. But remember to take time off to relax and recharge. I don’t mean just take a vacation, but have outside interests that get you excited and can help recharge your brain and provide you with another pool of knowledge and resources to draw from that may apply to your job. It’s amazing how knowledge gained from one area can be applied to another. Diversions like this can also help to train your brain and encourage relaxation. Physical activity is also very important to balance your mental activity. 4. Don’t compromise your values. Sure, everyone wants (needs) to make money, but at what cost? While your job may not define who you are, it certainly should reflect your values. Don’t make money doing something that you think is wrong and compromises your values. Similar to this is having a job that allows you to live the lifestyle you want. There is a lot to be said for listening. Hearing what other people have to say not only shows respect for them, but the process of evaluating different ideas can go a long way to solving problems or finalizing an idea. While you don’t have to agree, you can still learn from listening. Always think about applying different ideas to find new solutions. Does this advice help you at all? Do you have something to add that you have learned along the way? It is true, education is not over. I believe we need to constantly learn to grow otherwise we become stagnate. Such fabulous advice at any stage of the game!! Great thoughts. I especially like your advice to listen. Listen to everyone with an open mind. Once you hear them out, you can choose to disagree. We need more conversation in the world to make it a better place.